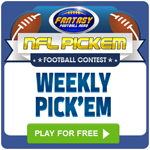 Free consensus NFL Picks for all Week 1 games. We have aggregated the NFL picks for Week 1 from multiple experts across the NFL including ESPN, CBS Sports, NFL.com, FOX Sports, and Yahoo to provide a consensus view of NFL picks. NFL Picks for Week 1 games are not yet available.